Two of the most common questions we get at UY are ‘what yarn should I use for this project’ and ‘are there any patterns that go with this yarn?’. There are many answers to these questions and that is what we are here for at UY! There are so many yarns and patterns out there, it’s sometimes hard to know which one goes with which. Hopefully this post will get you started, especially is you are the kind of person who likes to do their own research. There are a few different things to consider when subbing yarns. 1. Gauge: To me, this is the most important. If you are substituting yarns the first thing you want to look for is the gauge of the original yarn in the pattern. One of the most common mistakes people make is following the gauge on the pattern, not the yarn. This might not seem to make any sense but here’s why this is: sometimes patterns use needles that are much larger than the yarn would usually call for or much smaller. If I were designing a lace pattern, for example, I might call for big needles and very fine yarn. This will give it a nice open and lacy look. Or perhaps my goal is a very dense fabric, then I would use small needles and thick yarn. The last example would give you a small gauge but really you would want a thick yarn. See the trouble? If you had checked the gauge on the yarn, you would see that you needed a thick yarn. The other problem is that sometimes gauges are written ‘over pattern’. This means you are measuring over the pattern (maybe cables or lace), not in stockinette stitch. If you are getting 22 stitches per 4 inches over pattern, it might be more like 16 stitches per 4 inches over stockinette stitch. Because of all this we always check the gauge of the yarn, not the pattern. If it calls for a yarn that is 22 stitches per 4 inches in stockinette, that’s the yarn you will look for! Just to be sure, always check that the gauge is over 4 inches, not 1 or 2. Stay consistent. 2. Fiber: Different fibers have different qualities and will effect your knitting in different ways. You want to look at the fiber called for in the pattern and think about how your substitution will work. Silk, for example, has a lot of drape. This is great for clothing items but it may not be what you want for a complicated lace pattern because silk won’t block into shape the way a wool or alpaca will. Different fibers are also warmer than others. While alpaca is delightfully soft it is also very warm, this might not work in a sweater for Vancouver weather (most of the time) but it would be lovely in a scarf or mittens. Fibers like mohair or angora have a nice halo which can be an important part of a pattern. Smooth yarns are sometimes more desirable for cables while fuzzy yarns add a little spice to stockinette stitch. There are lots of fibers to choose from, just keep in mind the different qualities of them when substituting. 3. Spin: The spin of a yarn is something to consider, especially when you are knitting a garment. 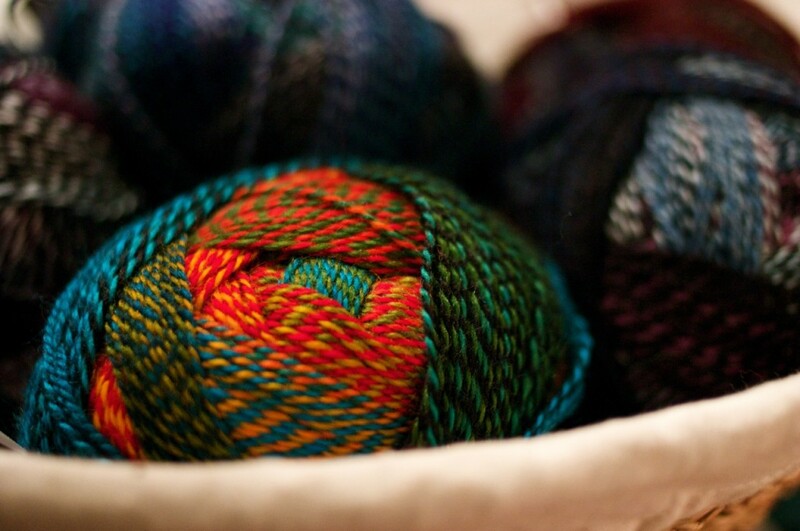 Yarns with less spin to them are often quite soft but they can shed or pill more than others. That being said ALL YARN PILLS. This is a fact. A few have tried to tell me that it is the quality of the yarn or that Merino doesn’t pill, it’s not true. Some yarns certainly pill more than others but all yarns pill. This isn’t too big a deal in a hat (not a lot of friction putting it on and off the head) but you might want to steer clear of loosely spun yarn for a sweater (pilling in the under arm is the worst). For a sweater I would look for a yarn with a good tight spin to it, or don’t worry about it, pilling is a fact of life. 4. Washability: One thing you might want to ask yourself is how important washability is for you. All yarns can be hand washed but only some can be machine washed or dryed. I don’t mind doing a load of hand washing every so often, but I have a lot of knitted items. Be realistic but also remember how much time and effort you are putting into your knitting, it won’t kill you (or anyone you gift knitting to) to hand wash. That being said there are some very nice superwash wools out there these days, no need to go acrylic! 5. Alterations: Ask yourself whether or not you are will to make alterations to a pattern. If not, be more exacting with your substitutions. If the pattern calls for a 22 stitch gauge yarn and you are really grooving on a particular 18 stitch gauge, you have to be ready to do some math and make some changes. Only you can decide on this one! It might seem like there is a lot to subbing yarn but really these are just a few tips and tricks. Knitting isn’t a science so don’t forget to be creative. Each knitted item is unique, partially because of the yarn substitutions you make. Enjoy! This entry was posted on Monday, March 22nd, 2010 at 9:43 pm	and is filed under Uncategorized. You can follow any responses to this entry through the RSS 2.0 feed. Both comments and pings are currently closed. Thank you for writing such an informative article. As a beginner, this is new information to me, and very useful (if I ever decide to knit anything other than scarves – which are very forgiving when it comes to subbing). Thank you so much for ALL the info! Much appreciated! !